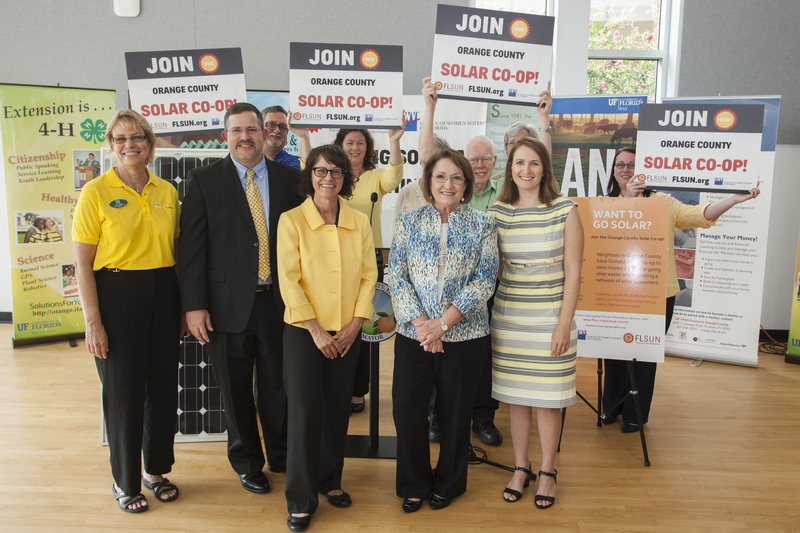 Orange County homeowners looking to add solar power to their homes have the opportunity to do so at a discount through a new solar co-op program announced by Mayor Teresa Jacobs on Aug. 8. The initiative is spearheaded by Orange County Government, the League of Women Voters of Florida and Florida Solar United Neighborhoods (FL SUN), which is a local nonprofit working to organize solar co-ops across the state. According to the Florida Public Service Commission, 11,626 utility customers (less than one percent) in Florida have rooftop solar installed. In Florida, these co-ops have worked with nearly 340 homes and businesses across the state. Solar co-ops provide bulk discounts – up to 20 percent – for a group of homeowners who are interested in purchasing solar panels. As part of a solar co-op, citizens benefit from the educational process and each participant signs his or her own contract with the installer, and everyone receives a discount. All homeowners who reside in Orange County are eligible to participate in the co-op. Mayor Jacobs has officially signed up for the co-op. She hopes other residents in Orange County will consider joining as well. The solar co-op supports the goals of the Mayor’s Sustainability Initiative, “Our Home for Life,” which seeks to reduce barriers to alternative energy and increase renewable energy production by 10 percent in 2020 and 25 percent by 2040. The exact price of a photovoltaic (PV) system is dependent on homeowners’ preference in system size and their home’s energy consumption. Additionally, there is a federal tax credit of 30 percent towards installation costs. Homeowners have the option to install the size PV system that fits their budget. “Experts tell us Florida’s sunshine gives it the potential to be among the top three states in America for solar power, and by joining in solar co-ops, Floridians can start planning for the sun to help pay their electric bills,” said Pamela Goodman, president of the League of Women Voters of Florida. The League of Women Voters of Florida has partnered with FL SUN and various markets in Florida, including Orange County and St. Petersburg, to promote solar initiatives. East Orlando resident Jon Weiss, director of Orange County’s Community, Environmental and Development Services department, is one employee who is already participating in a solar co-op and had solar installed in May of this year. Orange County has a goal to obtain 500 participants in the co-op program with 30 percent of the residents opting to Go SOLAR. The deadline to sign up for the co-op is December 2016. Orange County is sponsoring Community Power Network and FL SUN, both 501(c)(3) nonprofits, to provide technical assistance to neighborhood solar co-ops at no charge to participants. To learn more, visit the Florida Solar United Neighborhoods website. To view photos from the press conference, visit Mayor Jacobs’ Flickr album.